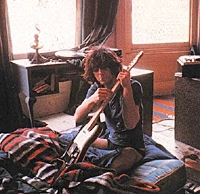 Syd Barrett was immortalized as the Crazy Diamond, and Pink Floyd live still bid him shine on. He was touted as a primary influence by everyone from Julian Cope to Robyn Hitchcock; he was covered by David Bowie and Love And Rockets; and, according to the legend to which he ascended 36 years before his death, he was as nutty as a fruitcake and he grew mushrooms in his basement. By Dave Thompson. [Flux & Reflux 6CD] This looks like it is a compact version of the huge fan project Have You Got It Yet?, more than 14CDs. All the music with one radio program. The rest of the interviews have been removed. VG to Ex from SBD and live sources. Here are some tracks featured on Beyond Rhyme Nor Reason. Click on the highlighted track to download the MP3. As far as we can ascertain, none of these tracks have been officially released. Welcome to the world of Syd Barrett, a world that fell silent on July 7 this year, when it was announced that the diabetes from which hed been suffering for years had killed him at age 61, at home in Cambridge. But it didnt really fall silent, because things have never been that simple where Syds concerned. The only difference is, instead of the acolytes lining up at his front door, to see if hell answer it with his underpants on his head, theyll be going to his grave instead, to dream the mystic visions that his music has always invoked, and mourn that the world never truly understood him. That much is true - it never did. He understood the world, though, and he played it like a harp. The story, as laid out both in the early accounts of Pink Floyds history, and across the first four discs in this collection, is simple. Graduating out of the workaday blues of the King Bees (the first two tracks, best-ever quality renderings of "Lucy Leave" and "Im A King Bee"), Floyd were in the van on the way home from a gig somewhere, when Barrett started messing around on his guitar, mutating the chords of Loves "My Little Red Book" and coming up with something else entirely. The earliest known rendering of "Interstellar Overdrive" dates from Halloween 1966, some six months after the first Love album was released, and already it's changed beyond recognition - a 14-minute instrumental freak-out that was so in keeping with the tides of Psychedelia now lapping around London that, for the next six months, the band barely recorded anything else (fully one third of disc one is consumed by versions). But then "Arnold Layne" gave them their first hit single; "See Emily Play" followed it up, and Piper at the Gates of Dawn confirmed Barrett as the poet laureate of the British underground. Barrett and Floyd parted ways during the sessions for A Saucerful of Secrets, the Floyd's second album. You can hear the hewing, on the album itself ("Jugband Blues," once described as a self-diagnoses of schizophrenia, but really just a reaction to Waters increasingly noodle-packed meanderings) and more especially on bootleg. association with the legend, either. alternate takes and obscure foreign acetates, possible Piper and Saucerful out-takes, brilliantine BBC sessions, strange flashes from the television, interview snippets and the occasional live cut (theres more on disc six, but the sounds a lot scratchier). Syds mind was apparently doing more than that, though. We may never know the truthful truth about his departure from the Floyd... did he jump, was he pushed, did he turn into a penguin and pour paint down Nick Masons periscope? But when Floyd lost their muse, their management gained a solo artist, and discs three and four trace its trajectory. Barrett recorded two solo albums following his departure from Floyd, The Madcap Laughs (1969) and Barrett (1970). Both are locked within the twilight world of Syd's own supposedly burgeoning madness, both are trapped within their own legend. Fiercely idiosyncratic, they are nailed around songs that either stride purposefully towards pure pop immortality ("Octopus," "Late Night," "Terrapin") or else bumble and tumble into their own unsteady laps ("She Took a Long Cold Look,") ("Feel," "It Is Obvious"). But the biggest regret upon hearing them today is that you didn't hear them when they first came out, before all the mythologizing was kicked into play, and the albums could still be accepted on their maker's own terms. Floyds growing immensity, and sales of their back catalog certainly ensured he could afford that luxury, while Bowies decision to cover "See Emily Play" on Pin Ups would keep the wolf from the door even longer. No one was saying he was in orbit, nobody thought he was strange. He was, simply, a recluse, and it wasnt as if pop had never seen one of them before. When ZigZag magazine ran journalist Barry Miles account of the Floyds early years in August 1972, the worst account of Barretts state of mind were a few wistful regrets about his dislike of the circus into which Floyds pop star fame had suddenly plunged him, and the occasional night when the acid got the better of him. A year later, the Floyd themselves followed it up with their own account of those heady days, and the only mention of madness was in conjunction with his genius - the (tragically unrecorded) day he tried to teach the band a new song, and kept changing it subtly on every run through. The chorus, split between Barrett and Waters, had one of them singing "have you got it yet?" and the other answering, truthfully too, "no no no." for EMI, who suddenly discovered an entire generation hankering for a couple of albums that hadnt sold a sausage since 1970 (the Syd Barrett twofer was released just three months later); for the Floyd, whod been struggling to follow-up Dark Side Of The Moon for two long years, then wrote the elegiac "Shine On You Crazy Diamond" practically overnight. And for Barrett, who was heartily sick of being asked for a comeback, and now had the perfect excuse to postpone it forever. "Sorry, but havent you heard? Im mad." His own final recordings, barely half a dozen inconsequential crackles of guitar playing that wrap up disc four of this set, took place in August 1974 and, listening to them, his lack of interest in the proceedings is deafening. He was only in the studio because someone somehow persuaded him to do it (a room full of brand new guitars probably helped as well) and, apparently, he even brought a few guitars with him. But he knew what people were saying about him, and he also knew that, if he really wanted to be left alone, the best thing was to let them keep saying it. He had his own life away from music and, again, he had enough money coming in to keep it that way. If he truly had redirected his muse away from music and back to his first love, painting, why on earth would be need to try recreating it? green light. Why is it that do you think? something to keep the accountants off Barretts back, the back catalog ticking over, and Floyd didnt exactly do badly out of their association with the legend, either. But its interesting to note that, for all the hours of outtakes from both Madcap and Barrett that have flooded out over the last two decades of reissues, not one unreleased note of Syds time with the Floyd has ever been given the green light. Why is it that do you think? Well, the official line, first spouted for "Scream Thy Last Scream," but patiently reiterated on occasion since then, is that its to save Syds blushes. But what do you think would show him in the best light? The pristine BBC sessions, or completed studio masters that rate among this packages most glittering highlights? Or the sound of him falling off his chair and dropping his guitar, as presented in living stereo across the bonus tracks on the official reissues? All this, of course, is paranoid conjecture. There is no suggestion whatsoever that anybody ever connected with either Floyd, Barrett or their respective record companies ever woke up one morning and said "wouldnt it be great if Pink Floyd had a tragic legend hanging over their head, a spirit that could be invoked whenever Roger writes another of his depressing songs about irrevocable loss, and that would keep the back catalog ticking over, while maintaining interest in the band as a whole." stick the occasional song on our compilations, dig them out when were playing live, and talk up your own records for the next wave of romance-starved teenagers." And certainly nobody would ever suspect a major record label of any form of complicity in such a ridiculous plot. But one thing is for certain. A lot of people did very well out of Syd Barrett being the way he was, and one just hopes that Syd himself was one of them. With its painstaking resurrection and remastering of every known Pink Floyd (58 tracks) and Syd Barrett (38 tracks) recording that has yet to see an official release, together with close to two discs worth of often fascinating (if not, necessarily, especially revealing) interviews, Beyond Rhyme and Reason is the last period collection you will ever need to own; just as Syd Barrett remains one of the most individual, exciting and unpredictable songwriters of his or any other generation, a weaver of words whose very enunciation was pregnant with visions. He sings of gigolo aunts and you can see them parading, of wolfpacks and rats, and you see them as well. And then theres "Octopus," lost in the woods with cackling sails and dream dragons, and that strange self-fulfilling prophecy as the madcap laughs in the bare middle eight. The thing is, though, if Barrett was the madcap (well, John was the walrus), ones thing for sure. If he is still laughing, then hes laughing at us. Note: Veteran music writer Dave Thompson is a regular contributor writing on hard-to-find rarities. Dave is the author of many well reviewed rock biographies, including the recent Virgin Books' Red Hot Chili Peppers biography, works on The Cure and Kurt Cobain. He wrote Cream: The World's First Supergroup which was published early last year. In the past, Dave has written for Live! Music Review and he is also a regular contributor to Rolling Stone, Mojo and Q magazines. Click here to buy Dave's books.